The Yeovil-based Petter company obtained a patent on calculator technology in 1923 and two more in 1930. The company then took out equivalent US patents. 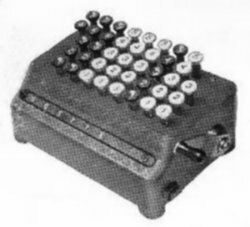 Designed by Percival Waddams Petter and produced in Yeovil by Petters Ltd, The "Petometer" was a decimal, key-driven ("Comptometer") type of calculator with an abbreviated keyboard (only having keys 1 to 5). To enter a number greater than 5 two keys had to be pressed in succession in that column. The lever on the right was for clearing the total. The 4 and 5 keys in the left-most column were used for subtraction using the "nines-complement" method. Bell Punch bought the design and rights of this machine in 1936 from Petters Ltd of Yeovil and the "Petometer" was the basis for the development of their "Plus Adder". 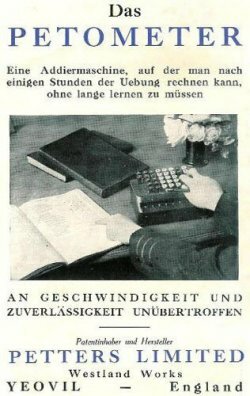 Some of the patents listed on the "Plus Adder S" machine were originally granted to Petters Ltd.
An advertisment for the Petometer in German from 1931 (seen at left) translates as "An adding machine, on which you can count after a few hours of exercise, without the need for extended learning.... Unbeaten on speed and reliability."